I am leaving my employment with the IMA. I am going to take up a post as HE Curriculum Innovation Adviser for the Maths, Stats and OR Network as part of the mathematics strand of the National HE STEM Programme, until July 2012. I have enjoyed my work with the IMA immensely and feel some regret at leaving, but my interests have always been drawn to HE maths education and the role in Birmingham combines my interests very well. I have worked for the IMA since January 2008 and, with your help, I have been engaged with an active programme of engagement with university students in the past two academic years. For example, over three semesters, spring 2009, autumn 2009 and spring 2010 I have given 74 IMA ‘Clement W. Jones Lectures’ to nearly 2,300 maths students and over 150 staff at 47 universities. And there are more understated influences, for example I designed and sent IMA leaflets to every maths department and every careers service in a university with a maths department in the country. I do some part time work at the University of Nottingham and I know the pile of IMA leaflets in the foyer there has been quite depleted over the last month or so of the academic year. Hopefully, this pattern has been replicated elsewhere. I sincerely hope this work will be reflected in the graduate recruitment numbers in this and future years. e-student: The IMA is working on an initiative to allow students a free ‘e-membership’ via the website. Students will be able to sign up to an area of the IMA website and get access to interesting and helpful content. There are many pressures on student finances and students are often not aware of the benefits they might find in joining the IMA, so this free signup to an area of the website will give students an opportunity to find out about the IMA and why they might want to join as Associate Members when they graduate. I see no reason why any student would not want to sign up for this service, with the result that many more graduates per year ought to be aware of, and join, the Institute. Tomorrow’s Mathematicians Today conferences: The first Tomorrow’s Mathematicians Today conference was the inspired idea of Noel-Ann Bradshaw and Tony Mann, who organised the conference at the University of Greenwich in spring 2010. At this conference undergraduate students presented on topics of interest to them and the event was a marvellous opportunity for students to practice their skills and take part in the wider mathematics community. The University Liaison programme has agreed to fund further Tomorrow’s Mathematicians Today conferences at Manchester in autumn 2010 and at London Metropolitan in spring 2011. I think these have the opportunity to be the IMA’s flagship events for undergraduate engagement and have a real impact on the Institute’s future. Professional networking: For postgraduates and early career mathematicians, the Early Career Mathematicians’ Group goes from strength to strength, providing an opportunity to meet others in a similar situation and to engage with other mathematicians in academia and industry. Although I am leaving this role with the IMA, I am not going so far away. I continue to be a Member and to work on the committee of the East Midlands Branch. Perhaps I will meet some of you as part of my new job as well. I trust you will all continue to evangelise for the IMA, helping to make students and early career colleagues aware of the Institute and the reasons you are a member. Remember that you get more out of your membership the more you are willing to put in, that membership has many advantages for individuals and that the Institute benefits from a strong and active membership. As we come to the end of the academic year I find myself reflecting on my travels over the year, particularly as these relate to my plans for next year. There follows a list of universities I have visited this year, either to give a lecture or stand at a maths careers fair. My best information suggests this represents two thirds of UK universities with a mathematics degree programme. If you are a staff member or student at a university that is not mentioned on this list, please consider contacting me to see if we can work together. I keep meeting staff at universities who are surprised that I am able to take the time to come and speak to their students. To be clear: my intention is that I offer to speak at any university with mathematics students in the country. My time is allocated for these lectures on a first come first served basis, with an attempt to arrange visits to several nearby universities in one trip for the sake of efficiency. It may be that I am in contact with someone at your university and we haven’t been able to find a mutually convenient time for a visit, or perhaps I simply don’t know anyone at your university. Some visits are arranged through the mathematics department, while others are directly with a student group or through the careers service. If a visit has been arranged, this may have been arranged by a student who is no longer around so it is still worth contacting me. Even if a visit is not possible to every university I would like to have some level of IMA involvement in every mathematics department in the country. As well as lectures we have leaflets we can distribute and a range of opportunities, including a grants programme, for student groups. In the 2009/10 academic year I have given 49 IMA lectures and operated 5 IMA stalls at careers fairs, and in doing so I have spoken to over 1900 students and 120 staff at 46 universities this year. 34 of the lectures were my ‘Careers for mathematicians’; the remaining 15 were on mathematical topics. 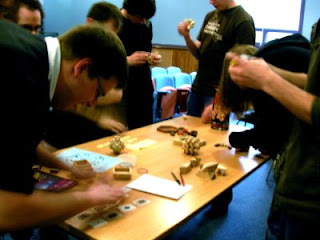 I currently offer lectures on ‘Puzzles’, ‘Cryptography’, ‘Chance & coincidence’ and ‘Spin in ball games’. We call these ‘Clement W. Jones Lectures’ in honour of Professor Clement W. Jones CMath FIMA, whose bequest of £20,000 helped fund the University Liaison initiative. This academic year I have visited the following universities: Aberdeen, Aberystwyth, Bath, Bolton, Brighton, Bristol, Brunel, Cardiff, Derby, Dundee, Durham, Edinburgh, Exeter, Glasgow, Greenwich, Heriot-Watt, Imperial College, Keele, Kent, Kingston, Lancaster, Leeds, Leicester, Liverpool, Liverpool John Moores, London Met, LSE, Manchester, Manchester Metropolitan, Newcastle, Northumbria, Nottingham, Nottingham Trent, Oxford, Plymouth, Portsmouth, Sheffield, Southampton, St. Andrews, Stirling, Strathclyde, Surrey, Swansea, UEA, UWE and York. A further six universities which I did not visit this year were represented by undergraduates at the Tomorrow’s Mathematicians Today conference at Greenwich: Birkbeck, Cambridge, QMUL, Royal Holloway, UCL and Warwick. If you are interested in arranging a lecture, particularly if your university is not on this list, please email me on peter.rowlett@ima.org.uk or say hello on Twitter @peterrowlett. March was an active period of visits to universities. I visited the West of England and gave my careers talk at Bristol, UWE and Bath, where on the advice of the Head of School I took an enjoyable walk down the hill back to the town. I gave the same talk at Brunel. Some readers may remember my praise of the maths careers fair at York in the February issue of Mathematics Today and I was happy to give the opening talk at the fair this year and gave my careers talk at Leeds in the same trip. At the end of term I travelled to Aberystwyth and gave my Cryptography talk. April was mostly taken up with the Easter vacation, with some universities returning for two or three weeks of teaching at the end of April and beginning of May. I gave my lecture on Cryptography at Derby. At Surrey I found a large audience, mostly of first year students taking an interest in their future at an unusually early point in their university career. This was particularly pleasing as most of them had finished an exam just an hour before my talk! By the time you read this, the Travels in a Mathematical World podcast will have released sixty episodes. I began producing the podcast in October 2008. I realised I was not going to reach every student at a talk or careers fair and so opportunities were needed to provide content electronically to a wider audience. On top of this, I realised that moving around the country as I do, I had a good opportunity to speak to a wide range of mathematicians about their work. Most mathematics students don’t know what they want to do when they graduate. This is fine – it may be why they chose mathematics in the first place – but by the end of their degree they really need to have thought through their options. In fact, hopefully they will have done so by the time they enter the final year. I have spoken to a couple of careers advisors who have told me the first graduate recruitment deadline is several days before term starts in September, so students who return in their third year have already missed the first opportunity open to them. Presumably employers with deadlines this early want to attract applications only from students who are well-organised. I want to encourage students to use their careers service. This is a resource that is valuable to them, but which, in my experience, they often don’t use. The opportunities offered by the careers service include, but are not limited to, finding out: who is hiring; what they are looking for; how to write a good CV; and, how to behave in an interview. But in order for the careers service to help the students make the difficult decision about what to do for their career, it is helpful if the students have explored the possible options. I think a short, ten minute audio podcast format provides a good method for this exploration. In my careers talk I ask students to listen to the podcast, and to read the Maths Careers website and the Plus Careers Library, to get an idea of the range of different occupations taken by mathematicians. Regular podcast episodes involve mathematicians talking about their work, their career or an area of mathematics they have worked in. We also have features on maths history and maths news. Podcast recordings are not well planned. Recordings are made opportunistically on days where I have gaps in my schedule and meet willing and interesting people. So while I can’t tell you there is a deliberate, well planned balance of topics and speakers, I think that now the podcast has reached 60 episodes it covers a good range of topics that should provide undergraduates with a wide variety of possible inspiration. Episodes are quite varied, featuring topics such as maths biology, coding, cryptography, engineering, fluid dynamics, wave dispersion, transport modelling, network optimisation, Bayesian statistics, stochastic calculus, architecture, art, education, maths communication, finance, category theory, astrophysics, crowd modelling and even invisibility cloaks! January is less active, while universities hold exams and end of semester coursework deadlines, and February is an active period of visits to give talks at universities. I have given my careers talk at Nottingham, Imperial, Oxford, Cardiff, Swansea, London Met and Keele. I have given a talk on ‘Chance and coincidence’ at Leicester. These 8 talks attracted 280 students. In February the University of Greenwich ran an undergraduate conference “Tomorrow’s Mathematicians Today“. I attended this with Sharon Evans AMIMA, who helped me by talking to the students about working as a mathematician. A conference report is available in this issue of Mathematics Today so I will say no more expect that it was a fantastic and worthwhile achievement. So you’re organising a careers fair for mathematics students? Okay, it’s a tall order you’ve set yourself but it can be done! I have attended careers fairs that have worked for mathematics students and those which have not worked as well. I would like to share with you some thoughts about how fairs work, when they work, for mathematics students. Mathematicians can be difficult to advise. Many, on telling people they are studying mathematics at university, get the reaction “So which do you want to do, accountancy or school teaching?” These options are fine for some but are not for everyone, while mathematics is a subject with an overwhelmingly broad range of options due to the wide ranging employability skills of its graduates. Some students, hearing this stereotype, feel detached and are turned off from seeking formal careers advice. I have had students approach me at careers fairs and say they think they have taken the wrong degree course, since they don’t want to go into teaching or finance! This is a problem as once they have decided what they want to do, the careers service can be very useful indeed: who is hiring, what they are looking for, how to write a good CV and so on. Expert careers staff can usually offer feedback on draft CVs and give mock job interviews for practice. Skills training sessions are usually available. Generally, the careers service can provide a really vital function but one that some students do not seek out. The students are going to get much more out of careers advice once they have an idea what they want to do. To do this, they must be encouraged to explore their possible options and this is where your fair will come in. As your students may be unexcited at the prospect of a careers fair, it is helpful to present the message that the fair is happening and worth attending from as many directions as possible. A very successful fair I attended at York was advertised jointly by the mathematics department, careers service and undergraduate maths society. Particularly, if lecturers are unenthusiastic about the fair the students will pick up on this and a negative attitude will spread. Conversely, if lecturers are encouraging, the students are likely to react well. Posters in the department are one thing, having lecturers ‘talk up’ the fair in their lectures is another level altogether. It is important to make sure the event is relevant to the students. I have attended fairs for multiple subjects and the mathematicians tend not to turn up to these in substantial numbers. At a maths-specific careers fair, the students perceive the advice, employers, etc. are aimed at them specifically and this can be a more attractive draw. Silly though it sounds, distance can be a real factor. If students have to leave the areas they normally visit you have already lost a proportion of them. Run the fair in a building they visit often, perhaps where they take lectures. Keep them in their comfort zone, in their home territory. A Careers Fair is a scary prospect, full of scary employers. If you make them comfortable and make it easy for them physically to attend they are much more likely to drop by. Plan the fair well in advance, schedule it when the students (at least final years) aren’t busy and if possible put it on the students’ timetable. Don’t let on that attendance is anything but compulsory. I’ve been to fairs where a whole or half day has been scheduled with no lectures to make sure everyone is able to attend, though this is a difficult decision to take. If the fair includes employer stalls, have this within a fairly tight period. I have been to fairs that last all day and the number of students at any one time is low. I have also been to fairs with a tight period – the Calculating Careers fair at Manchester has hundreds of students focussed in just a couple of hours – and this leads to greater numbers in the room at any time. The students are more likely to know others when they arrive – safety in numbers! – and so more likely to stay for longer. Having a busy room and limited time produces an energised environment that benefits everyone. The stallholders will appreciate a more focused time period as well. It is very tempting to try to get students to put their names on a sign-up sheet for individual sessions or even the whole day. This can help in planning room sizes and I think there is a perception this makes students feel they have made a commitment to attend. In my experience students are not good at making such a formal commitment and, having not signed up, feel they can’t just drop in. Those who do sign up are far from certain to attend. A way to create a buzz about your fair among the students is to involve them in the planning. Ask the students what employers they want at the fair. The employers are more likely to attend if you can tell them “our students have asked that I invite you” and the students are more likely to attend if they know the employers they want to talk to are there. If there is a student rep. or a student maths society, get them involved as well. If the students feel some involvement with your fair and start talking about it to other students this is the best advertising of all – peer endorsement. Perhaps the students can plan a social event – cheese and wine, for example – to end the fair, which can help encourage attendance and allow the employers to speak to students in a less formal setting. If you are having employers, getting a good mix is crucial. Not everyone you invite will come but try to get a mix of job sectors. Go to the IMA website and look at the Careers Advice leaflet, available via www.ima.org.uk/student. On page 3 of this is a list of job sectors: try to get employers from each sector. In the Professional Affairs section of the website is a list of employers who are Friends of Mathematics (mostly because they employ mathematicians). If you lean heavily towards one kind of employer, you will put some students off. With a good mix of employers there is something for everyone. In rule 7 I suggested asking the students which employers they would like to talk to – this can be a significant factor in encouraging attendance. 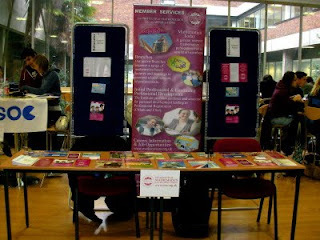 I had an interesting experience earlier this year at a very successful fair at York. I opened the fair with my careers talk. This was an exhilarating experience, the students responded really well and left my talk straight into the hall of employers, enthused and ready to learn more about their career options. I talked about careers options, taking charge and choosing your own path, employability skills, evidencing those skills in a job application and having a professional career development following graduation. Feedback given to me from employers at the fair in York was that the students were enthusiastic (in precisely the way they normally aren’t at such fairs), pragmatic and realistic about what they need to do to get a job. I think this was a good experience all round and it was well worth firing the students up with an opening talk. Students like to meet early career mathematicians. They like to see people who were in their position just a few years ago and find out how they got to where they are now. Particularly if they are graduates from the same university. To be seen as a role model at their former university is good for the professional development of the speaker. The IMA can help here by trying to connect universities to IMA members who are recent graduates. Email me if you are such a recent graduate or if you are organising a fair and would like to find some (peter.rowlett@ima.org.uk). Students also value practical advice which is applicable to job hunting. The careers service can likely help here in running career development workshops. A fair I attended at Portsmouth had a full programme of careers skills sessions and employer talks and the students responded very well. With an awareness that not all students are interested in all the options open to them, this used parallel sessions to make sure there was always something for everyone. If there are mathematics staff who have previously worked in industry they might be able to give good practical advice as well. I saw an excellent CV writing session at Greenwich by a lecturer whose former job included assessing CVs to hire graduate mathematicians. If you are considering running a maths-specific careers fair and would like to talk to me about this I can be reached on peter.rowlett@ima.org.uk. This period I have been busy with visits to give talks at universities. I have given my careers talk at Kent, Durham, Sheffield, Dundee, Stirling, Strathclyde, Glasgow, Brighton, Portsmouth, Exeter and Plymouth. I have given a talk on cryptography at Sheffield, Aberdeen, St. Andrews, Heriot-Watt and Southampton, a talk on puzzles at LSE, Newcastle, Northumbria and Edinburgh and my spin in ball games/Wii talk at York. In the 10 week period (Oct-Dec) of teaching in the autumn term I have given 32 talks and operated 3 careers stalls and so have spoken to over 1100 students and 80 staff at 29 universities. Also in November 12,600 IMA leaflets were distributed to 71 university maths departments, careers services and student societies. If you work in a university mathematics department I hope you will have seen these around the department. I spoke on my activities to the 11th Younger Mathematicians Conference in Birmingham. In December I had my six monthly meeting with my steering group and annual appraisal. I am pleased to report both went well. The nature of university life means that the undergraduate students I engage with are only likely to be around for a limited period of time. This engagement is usually though either a student run society or through a student member of a staff/student liaison committee. The end of one academic year and transition to the next is a potentially dangerous time for this engagement with students leaving their role within the department or society or even graduating and leaving the university altogether. I have spent some time at the end of the academic year trying to maintain contact with the students and societies I have had a relationship with, making contact with the next years students where possible. By the end of the last academic year I was in contact with student representatives or societies at 20 universities. If I lose contact with these I will start academic year 2009/10 back at square one in terms of student engagement and this is a large risk in the University Liaison role. On the staff side I hope the situation will be more stable. There are changes in staffing and staff roles though these are found in a much smaller number of cases. At the time of writing I have made contact with next years students at 14 of the 20 universities I was in contact with last year and I consider this to be a good rate of return. My best information suggests there are 72 universities in the UK offering mathematics. I enter the new academic year with a prior relationship with a staff or student contact (or both) at 50 of them. My thoughts now turn to planning my activities for the 2009/10 academic year. As in the previous academic year I will travel around the country offering my talk on careers for mathematicians and recreational mathematics lectures on various topics. I will also continue to operate on behalf of the IMA at careers fairs and postgraduate research conferences. In the last academic year I have visited 33 university mathematics departments and given talks and/or operated stalls at 23 of these. I am keen to increase these numbers next academic year! If you want to approach me with such an opportunity I would be very pleased to hear from you. I am also very interested to make contact with the 22 ‘missing’ universities so if you think I haven’t been in contact with your university please get in touch. You can email me on peter.rowlett@ima.org.uk. Another area where your university and the IMA can work together is University Liaison Grants to support student mathematical activities and there is more on this in the Student Section. This period is the summer downtime and I used the opportunity to take much of my annual leave. Consequently my activities were lighter than usual in this period. I attended the 3rd European Postgraduate Fluid Dynamics Conference at the University of Nottingham. This conference organised by and for postgraduate students was supported by an IMA Small Grant and I attended with a stall during the poster session and closing lunch. I believe the organisers are preparing a separate report on this conference. The materials on my stall included the Institute’s new Initial Professional Development (IPD) leaflet which explains to younger members what to do to start on the path to the Chartered designations. I travelled to Brighton for a visit to the School of Computing, Mathematical and Information Sciences at the University of Brighton and to attend a ceremony at that university in which IMA Prizes were awarded to two graduands. Finally I attended an Open University summer school on mathematical modelling and gave a version of my careers talk.